History provides much evidence of the temporal gap between the advent of a new martial technology, and the ability or willingness of a military organization to take advantage of or adapt tactics to that new technology. For example, during the American Civil War, generals versed in the tactics of the Napoleonic era continued to apply those tactics, despite the advent of the rifled musket which rendered the massed frontal assault little more than precursor to slaughter. During the First World War, the French sent wave after wave of infantry against German Maxim machine guns, relying on cran ("guts") and the bayonet to win the day. It didn't. In the field of martial longarms there is ample evidence of this trend towards tactical conservatism. Perhaps nowhere is it more evident than a certain curiosity in the design of the first bolt action magazine repeating rifles adopted by major powers. Most, if not all of them were designed with devices designed to prevent cartridges from feeding from the magazine, so as to permit the rifle to be used as a single loader. These devices were called "magazine cut-offs." Many rifles used in conflicts as late as the Korean War still displayed this feature, or at least the mountings therefore. It is our intent to briefly cover the thought and theory behind these relics of 19th century military thinking that survived into the 20th century as well as to identify and explain some of the more common mechanisms used to achieve the cut-off effect. 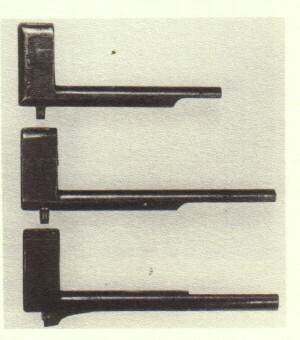 The almost universal conversion of single loaders into magazine arms, or arms capable of being used at will as repeaters, will introduce a new element into fire tactics, but it may be doubted whether any change will consequently take place in these tactics, or if any such change would not be a step in the wrong direction. Fire discipline, the necessity of controlling and steadying men firing, and thus preventing a wasteful expenditure of ammunition will be of just as much importance as ever. In a circular memorandum dated 2nd November 1886, His Royal Highness the Field Marshal Commanding in Chief directed that "Independent firing in the attack formation should be discontinued altogether and that in future, volley firing should be employed during all stages of the attack." It is said that with the introduction of magazine arms a new system of fire discipline will come into play and that the soldier will be taught to load and fire from his magazine on all occasions. The command "fire one, two, or more shots" will be substituted for the caution "fire one, two, or more volleys." This would be simply re-introducing "Independent firing" with all its attendant evils. The magazine question is more or less a political one and the general conversion of single loaders into repeaters which is taking place all over Europe is due, not so much to the superiority of the magazine arm as to the feeling that it is necessary to keep abreast of one's neighbours. An examination of the state of affairs both at home and abroad shows clearly that the weapon of the future has yet to be found. Colonel Slade's remarks are more useful to the historian and the cruffler when one takes into account that they accurately reflected the thinking in most of Europe and the United States at the time. The military, then, were far from convinced as to the utility of the magazine repeater. This had much to do with the fear that such an invention would create an attendant breakdown in discipline. Until the advent of the magazine repeater, the individual infantry soldier was only as effective as his unit. To make a unit effective, the individuals within it had to be subordinated, with respect to fire discipline, to that unit and its leaders. The very idea that an individual could attain some level of effectiveness threatened the very core of small unit discipline. So, while it was hard to dispute the utility of the magazine, conservative military thought dictated that it be adopted as a reserve capability. 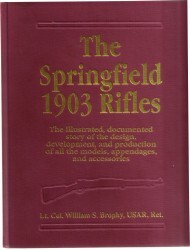 There was no uniformity as to how the various cut-offs achieved the effect of permitting the use of the rifle as a single loader while holding the contents of the magazine in reserve. We'll look at two of the most popular mechanisms, the plate and the spindle, and their application in several rifles that served well into the the 20th century. A cut-off was incorporated into the mechanism of the first Lee type rifle (the Lee-Metford) adopted by the British military in December 1888. This cut-off mechanism remained basically unchanged and continued to be incorporated into each successive iteration of the Lee rifle until it was finally deleted with the approval of the Mark III* Short Magazine Lee Enfield (SMLE) on January 2nd, 1916. Old paradigms die hard, however, and it should be noted that the omission of the cut-off was not necessarily a feature of the Mark III*, and that the cut-off was reinstated after the First World War for mounted forces and certain other units. In fact, post-war developments of the SMLE (the Marks V and VI) incorporate the cut-off, and even the trials No. 4 Mark I in 1933 was equipped with a cut-off. was provided with a knurled gripping surface that protruded slightly from the right side of the of the rifle. When the cut-off was pulled out and forward, the rounds in the magazine were able to rise into the path of the bolt face. When the cut-off was pushed in, the plate covered the rounds in the magazine and forced them down, out of the path of the bolt face, allowing the rifle to be used as a single loader. 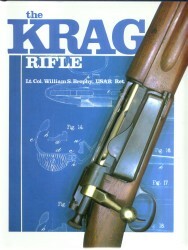 Image Credit: Brophy, Lt. Col. William S., The Krag Rifle, The Gun Room Press (Highland Park, New Jersey, 1995) Page 31 The Krag-Jorgensen rifle was adopted by the United States in 1892. This rifle represented quite a number of firsts for the United States Army. It was the first small bore smokeless powder magazine repeating arm adopted by the United States. And it was the first United States rifle to incorporate a magazine cut-off. The cut-off was of the spindle type and was located on the left side of the receiver. The spindle was a steel rod with a flat thumb piece at the rear, and a milled portion at the front with a hemispherical cross section, called the spindle point. When the thumb piece is turned down the spindle point lies entirely within the milled recess in the left wall of the receiver. When the thumb piece is turned up, the spindle point rotates into the magazine channel, pressing the cartridges down in the magazine. 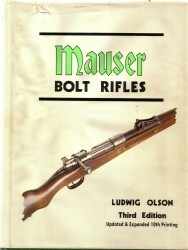 As a result, the uppermost cartridge is held below the path of travel of the bolt, and the rifle functions as a single loader. in the "Off" position. 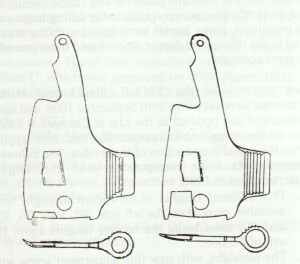 When retracted, the bolt contacts the unmilled portion of the cut-off and thus cannot be drawn far enough to the rear for the bolt face to come behind the uppermost cartridge in the magazine. 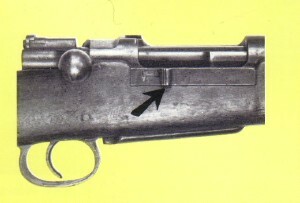 Additionally, the front end of the cut-off projects over the rear end of the uppermost cartridge in the magazine, holding it below the path of travel of the bolt, allowing the rifle to function as a single loader. When the thumb piece is turned up, the magazine is in the "On" position. The milled portion of the cut-off is rotated into place, creating a clearance in the bolt's path of travel. The bolt can now be drawn fully to the rear, allowing the top cartridge to rise high enough to come into the path of the bolt face. Additionally, on the M1903 rifle, the cut-off serves as the disassembly latch. 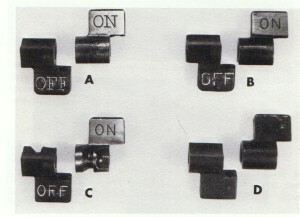 When it is rotated into the middle position, the bolt can now clear the cut-off entirely and be withdrawn from the receiver. lowered position, such that it was out of the bolt's path of travel. 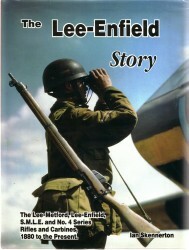 In this manner it was akin to the Lee-Enfield type of cut-off. Other than the experimental Model 1888 and experimental US Army test rifles, the Turkish Model 1893 was the only smokeless powder Mauser to be fitted with a cut-off. Though the cut-off was a vestige of 19th century military tactics and thought, it survived until the middle of the 20th century, from approximately 1880 to the late 1950's. And while it may seem inconsequential, this device had a longer service life than many types of 20th century arms; the submachinegun saw front line service for barely thirty years; the self-loading battle rifle for barely forty. Interestingly, many assault rifles have mechanisms for shutting off the gas system . And so, the cut-off survives in many different forms into the current day. In doing so, it may just be the longest lived feature of modern military longarms. Not bad for a 19th century anachronism!